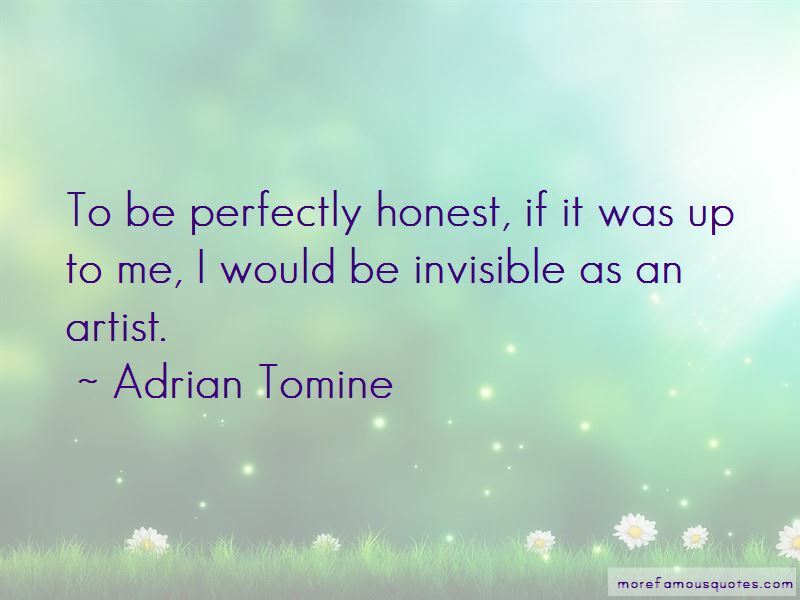 Enjoy the top 118 famous quotes, sayings and quotations by Adrian Tomine. I'm sometimes a cartoonist, and there's an audience for that, and I'm sometimes an illustrator, and there's an audience for that. It's absolutely chilling to think that I've been working on a comic-book series called 'Optic Nerve' since I was sixteen. Ninety percent of the time when I'm working, there's this very palpable sensation that I'm doing everything wrong and should just give up. To be perfectly honest, if it was up to me, I would be invisible as an artist. I really love New York, but I have to say, the humidity during the summer is a nightmare for a cartoonist. Not only am I sweating in my studio, my bristol board is curling up, the drafting tape is peeling off the board, my Rapidograph pens bleed the minute I put them to paper ... it's a disaster. Most normal boys, as they're growing up, they - in order to become attractive, they might, you know, get good at sports or join a rock band or develop good social skills, and for some reason, I thought that drawing comic books might be my route. The art editor in charge of the covers at the 'New Yorker' is Francoise Mouly. She's very familiar with the eccentricities and personalities of cartoonists, so working with her is very easy. There have been a handful of assignments over the years that I've had to turn down due to time constraints, and I was fairly envious when I saw the finished product, beautifully illustrated by someone else. I do think it's getting more and more rare in this country to raise a kid with the attitude that creativity is something valuable. The idea of trying to make the effort to produce something, to put something out into the world, rather than just taking in all the stuff the world's putting out at you. I get nervous about the effect that the high speed of everything will have on creativity. It's already sad for me to see that a lot of young aspiring cartoonists are putting stuff on the web, doing animation on the computer rather than making zines or mini-comics, which seem to be going the way of the dinosaur. I guess there's just a part of me that's not very enthusiastic about finding myself ten years from now halfway through a story that may or may not be any good. One of the by-products of being allowed to start my professional career prematurely is that the evolution of my work is really evident. I wanted it to be as readable as possible. I had the ambition of reaching a broader audience. 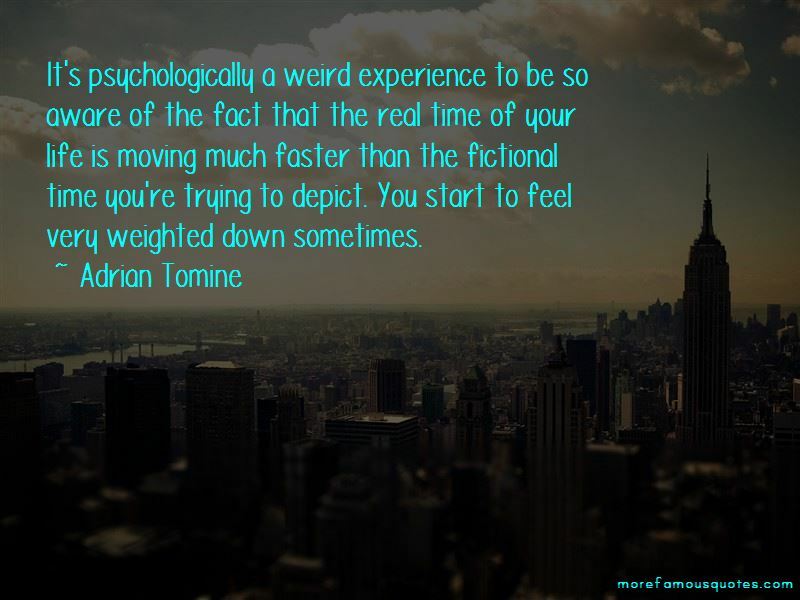 Want to see more pictures of Adrian Tomine quotes? 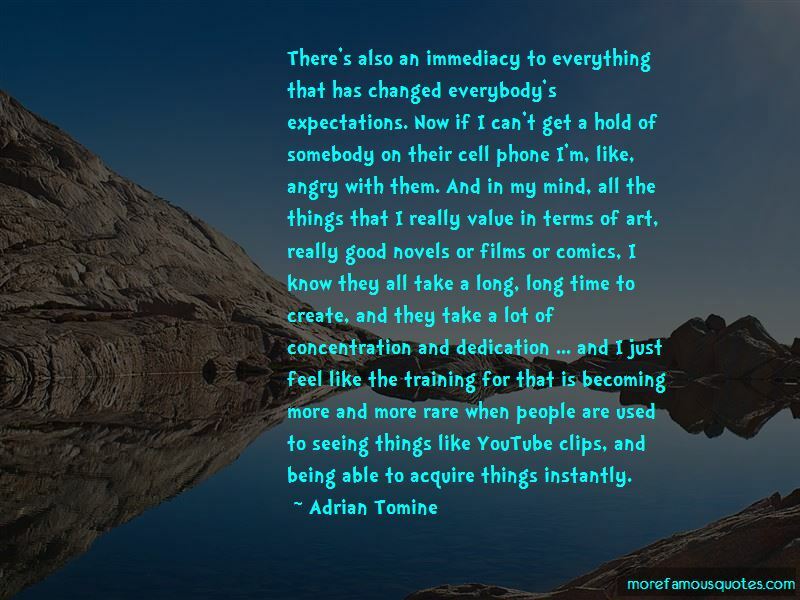 Click on image of Adrian Tomine quotes to view full size.